P2P Lending: How are interest rates set? Everybody talks about the win-win situation p2p lending offers for lenders and borrowers. By cutting out the large spread a bank takes when making a loan, the lender can get a higher interest rate, than he might in a savings account and the borrower may get a lower interest rate, than using his credit card. But who does actually decide what the interest rate for a p2p loan will be? Individual Loan Listings vs Markets: With Listings (e.g. Prosper, Lending Club, Auxmoney, Isepankur) lenders can look at individual loan listings and see multiple parameters (e.g. credit grade, income, DTI, occupation, location,…). The lender can select (“filter”) loans based on his strategy. This is not necessarily a manual process as he can opt to use automatic bidding tools that make the selection for him based on criteria he set in advance. Other p2p lending services use Markets (e.g. Zopa, Ratesetter) which combine loans based on broader criteria (e.g. loan term, or credit grade). Here a lender can only decide which market to invest into, but does not pick individual loans. 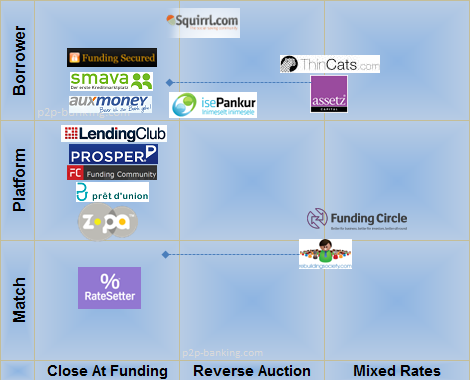 Close at Funding vs Auctions: Some p2p lending services close loan listings once they are 100% funded. The loan is then originated. Others uses an auction process where the listing is open for bidding for a set time. If the loan amount is 100% funded then the bidding continues for the remaining auction period. New bids at lower interest rates push out old bids at higher interest rates, thereby lowering the final interest rate for the borrower. Some p2p lending services allow loan listings of both types or let the borrower prematurely end an auction (e.g. Rebuildingsociety, Isepankur, Assetz Capital). Uniform vs Mixed Lender Rates: After an auction the interest rate for the borrower can be set at the rate of the highest successful bid. In this case all lenders on the same loan get the same uniform interest rate (e.g. Isepankur). Another option is to calculate the interest rate as an aggregate of all successful auction bids. In this case each lender gets the rate he did bid – there will be a wide mix of lender interest rates on the same loan (e.g. Rebuildingsociety). The borrower decides, what (maximum) interest rate he is willing to pay (e.g. Smava, Auxmoney, Isepankur). The lenders can then decide, if they want to fund this specific loan at that rate or not. If there is an auction and lender demand is strong, then the borrower may get the loan for a lower interest rate then specified. Obviously lenders will fund loans with most attractive rates first and other loans will go unfunded. These borrowers can react by relisting at a higher interest rate. In this model the platform sets the interest rates based on criteria it has defined. The interest rates will typically differ by credit grade of the borrower, loan term and possibly more criteria evaluated upon the borrower application. All loans matching the criteria will have the same interest rate, if funded. Rates are moving upward or downward based on the demand and supply activity in the recent past. So there are multiple models used by different p2p lending services. Some marketplaces adapt their models over time. Prosper and Auxmoney no longer use auctions. Zopa now uses Tracker Rates for the Safeguard Loans. Funding Circle recently raised minimum lending rates. Speed of funding: If there is a set auction phase then this delays the payout to the borrower, even if it allows him to profit from lowered interest rates. If competition or the marketing message require a fast approval and payout process this might lead to moving away from auctions. Other options are shorter auction periods, letting the borrower decide, if there should be an auction, or letting the borrower close the auction prematurely. Attracting borrowers: If the p2p lending services sets the rates, it can competitively price certain “signal” segments. Zopa did/does that to get good rankings in loan comparison services. Attract lenders/avoid negative PR: The main reason that p2p lending services failed in the past (e.g. Boober), is that the level of bad debt got to high and losses exceeded earned interest resulting in negative ROI for many lenders. Platforms might feel they need to protect the lenders from underestimating and underpricing risks. Also competition between lenders might lead to falling interest and resulting ROIs might lead to problems in attracting new lenders. This could lead to p2p lending services setting the interest rates themselves, or imposing minimum lender rates, or abandoning auction models. Matching demand/supply: To do this the p2p lending service might feel that he has better control if he sets the interest rate. I am a big fan of letting the market forces of demand and supply setting the price. Sure this allows exaggerations (and for some incautious lenders this might result in low or negative ROIs) but over time I believe this will lead to stable marketplaces. If the p2p lending services strongly influences the price then it is doubtful that he will do a better job matching demand and supply in the long run than the market forces would. And if the selection choices for lenders are minimized or taken out then these might feel patronized, resulting in lender churn (see recent comments in the Funding Circle and Zopa forums as examples). Same goes in my opinion for transparency. One of the key advantages why lenders and borrowers welcomed p2p loans as an alternative to bank loans, was the transparency of the whole process including the pricing. Some recent steps take out some of the transparency with the risk that in a distant future the p2p lending services might be perceived as much a black box like some banks are today. Infographic: Who sets initial interest rate on p2p lending platforms? You need to look at early incarnation of Prosper to know why market setting interest rate wouldn’t work. These platforms are dealing with unsophisticated lenders. The time required for lenders to become sophisticated is very long for platform to remain in business. Also, as Prosper experienced, lender ignorance gives bad reputation to the platform and its future viability. It will be several years if not decade before a market setting interest rate will succeed or platform has to be restricted to institutions. Thanks for the comment. One aspect of the “early days” of Prosper was that default rates exceeded the expected default rates Prosper advertised on the site. So anybody relying on this information supplied by Prosper at that time could be called an “unsophiticated lender”. This is a good example that – at that time – the platform did not know any better than the lenders itself. Maybe 2006/2007 was just to early to have any reliable data.